Bukola Koiki was born in Lagos, Nigeria and came to study art in the United States as a teen through a series of events involving a secondary school classmate and the American Visa Lottery Program. She received her MFA in Applied Craft + Design from Oregon College of Art and Craft and Pacific Northwest College of Art in May 2015. Her work explores cultural hybridity and cultural dislocation through the lens of memory, language, rituals, and rites of passage using a variety of mediums including fibers, dye processes, papermaking, printmaking and more. Bukola is influenced by an appreciation of personal and cultural history, significant objects, pattern, color and her own navigation of the third space as an artist who lives between cultures. 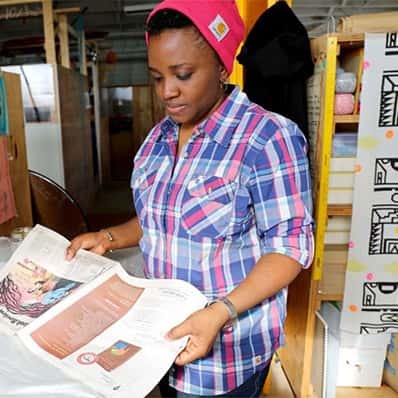 Bukola has exhibited her work in galleries in Portland OR, Morristown, NJ and Gatlinburg, Tennessee and her work has been featured in Surface Design Journal and online in Art21 Magazine and Art Practical. She currently lives in Portland, OR.